What is a game? Evolution embedded play into the very fabric of being human, and so this is a question that has been pondered since the dawn of man. It may be somewhat baffling, then, that we are still unable to reach a consensus. Searching the web for the “definition of a game” will unearth many different explanations, each described by someone who sees games in a disparate context. The more diverse definitions you read, the more it becomes clear that “game” is one of those words that's overloaded with meaning. If you consider that we derive what a game is from our own personal perception of play, it's not surprising that there are as many definitions as there are individuals. The flexibility of the term becomes a problem if you want to analyse an existing game, or create a new one. In order to design a game, it's essential to understand the building blocks at your disposal. We can model a game in an infinite number of ways, all different, and all valid. But to be useful, a model must be complete, whilst remaining simple. It needs to be elegant. While at this year's PAX East I attended a panel presented by the creators of the GeekNights podcast, Brandon DeCoster and Scott Rubin. It was called “Beyond Candyland”, and sought to explore the theory behind the best German-style board games. They identified “Decision” as the distinguishing factor between games rooted in "Randomness", like Monopoly or Trouble, and games of skill, like Puerto Rico or Dominion. Both Randomness and Decision can decide who will win a game, as an event of either will alter the probability space of the game yet to be played. The difference is, you have complete control over the decisions you make, and can take gratification from your performance if you're victorious through Decision. This is why we favour games that are more heavily weighted towards Decision over Randomness. As well as Randomness and Decision, the GeekNights duo completed their model of a board game with “Psychology”. Psychology consists of the elements of a game that can not mathematically change the outcome, but augment the rules, like story. A player could choose to completely ignore the Psychology in a game, as it does not alter the probabilistic outcome of the decisions they can make. Poker is an example of a game that is almost pure Psychology. The cards you are dealt are determined through Randomness, and the probability of your hand winning against an arbitrary number of hidden hands is a solved problem. In theory you should only bet on hands with a probability of winning of more than half, so the Decision is made for you. Poker would be a pretty boring game if everybody followed this strategy, simply becoming a game of the luck of the draw. The fun of Poker is in reading and bluffing your opponents, trying to beat the odds. It is a game of accruing or falsifying information outside of the rules of play, which is achieved by reading and influencing human Psychology. Randomness, Decision and Psychology comprise an elegant model to describe board games, but it needs a bit of work to be able to be applied generally to all games. Brandon and Scott observed that if you add Physiology as a fourth component, we are able to extend the model to include sports. They proposed that when a game rewards dexterity, strength, speed or stamina, it becomes a sport, and that perhaps videogames can be considered sports. I would draw a semantic line between videogames and sports, but agree that both are categories of games that can be classified by this simple, four-axis model. The model is intuitively complete. All human faculties are addressed, any rule system can be specified, and we can describe all environments in which a game can be played. We now have an elegant model for the entire universe of games. 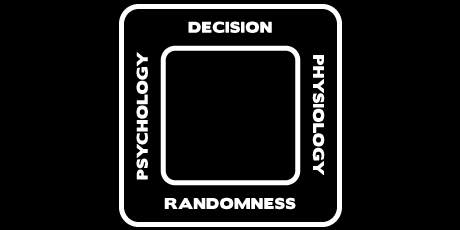 Every game can be constructed from four components, and four components only: Randomness, Decision, Psychology and Physiology. This is an incredibly powerful observation, as it gives us a vocabulary we can use to accurately describe a game and compare it with any other game. I've dubbed this model “The Quad”, and find it particularly useful when dissecting videogames. It's a common crutch to say that you like a game because it's fun. However, fun only describes what you feel when your body produces the chemicals to reward achievement. In order to understand how this state of elation is induced, The Quad can be used to identify which aspects of a game lead to you having fun. You can then look for these components in other games, or aim to recreate them in your own. In my next post I'll be following up this introduction to The Quad by applying the model to games that I like and dislike, and looking at the differences between contemporary indie and mainstream games. Since 2009, Stargazy Studios has been creating innovative games, operating as an agile & independent micro studio. Jeffrey Sheen performs all game development duties at Stargazy Studios, including design, programming, & business management.